There used to be a really great little Hungarian restaurant named Paprika’s in Salem, just a few minutes’ drive from our house. I don’t think there was a single thing there, familiar or not, that I didn’t enjoy trying… well, if you twisted my arm, I’d say that the cold cherry soup would have needed a lot of getting used to. Anyway, it closed a few years back and I was really bummed. In order to get my fix now, there is only Gustav’s in Portland (yummy, reasonably priced German food; the one by Washington Square is far superior to the one in Clackamas) and Novak’s Hungarian restaurant in Albany, which I have yet to convince my husband could be worth the drive to try out. Thus, every so often, I have an urge to make spätzle and schnitzel, goulash or chicken paprikash, or pierogies. (Actually, all of those are sounding good right about now!) One of the dishes I kept trying to convince myself to make was cabbage rolls, but every time I thought I was feeling up to it, I chickened out. My principal concern was getting the cabbage leaves off the cabbage whole, and I pictured myself ever so carefully removing leaf after leaf only to end up with a pile of shredded leaves I could only use for a sauteed side dish. This time, though, I refused to talk myself out of it. I read several methods for cabbage leaf removal, including boiling, freezing, and steaming, and ended up going with the latter. As it turns out, removing the leaves whole wasn’t my problem. That would be paring or trimming down the thick part of the stem and the base of the leaf while leaving enough area to wrap a nugget of meat filling. I kept ending up with leaves that were limp in the top half and not flexible enough in the bottom half, even after thinning the stems and cutting a small triangular notch from the base. I ended up having to steam the individual leaves to get more flexibility, and that worked alright, I guess, since I was able to make a dozen or so rather small and lumpy cabbage roll-esque bundles. All I can say is, start with a big cabbage, or use two, because I was getting down to some pretty small leaves for the last few rolls. As for the recipe itself, I did a modified version of a Wolfgang Puck recipe that I found on the Food Network website. I ground a thawed pork loin and ground that for the filling, and I was very happy to use up the last of a loaf of roasted garlic bread for the crumbs (Jeremy keeps getting multiple loaves of fresh bread from Costco, and it’s very hard to eat them all before they go stale, particularly the savory sort that can’t be used for French toast). I had more filling than cabbage leaves to roll, so I used it for meatballs; they just got tucked in around the rolls, and fared beautifully. Other than that, my main modification was to remove the rolls and meatballs from the pan after cooking and puree the sauce with a good dollop of sour cream, because the sauce looked so thin to me and I had some sour cream on hand to use. It worked out perfectly, and made so much sauce that if I had been thinking straight, I would have saved it to serve as a main course pasta sauce in the next night or two. So were the cabbage rolls worth all the trouble? I’m not so sure. They tasted great over mashed potatoes, and we both really enjoyed them. But the cabbage leaves and bundling were so time consuming (and not a little frustrating) that I think next time I will just make meatballs of the filling, cooked in the sauce, and served with a side of sauteed cabbage and much less fuss. At least now I can say that I’ve conquered cabbage rolls, though. Make the filling for the Stuffed Cabbage Leaves: Put the bread cubes in a small mixing bowl, add the milk, and leave the bread to soak until it is completely saturated. Squeeze out the excess milk with your hands; discard the milk and add the soaked bread to a large mixing bowl with the meat, parsley, sage, garlic, sugar, salt, and pepper. Mix well, cover with plastic wrap, and refrigerate. Steam the cabbage for 5-10 minutes, until the outermost leaves are pliable. After removing several softened leaves, you will likely need to continue steaming the inner leaves. Peel off at least 12 leaves total. Holding each leaf rib-side up, pare the thick part of the rib to flatten it. If necessary, cut a small triangular notch from the thick base of the stem, or steam the individual leaves for a minute or two more to soften the base. Place a small handful of filling in the center of each cabbage leaf. Fold the sides of the leaf over the filling, overlapping them slightly, and then, starting at the stem end, roll up the leaf into a compact bundle. Set aside. Meanwhile, make the sauce: Preheat the oven to 400F. Heat a large heatproof saucepan over medium-high heat. Add the olive oil, onion, and garlic and saute until the vegetables are translucent. Add the tomato paste and paprika and saute briefly. Then, stir in the chicken stock, tomatoes, balsamic vinegar, sugar, and sage. Season to taste with salt and pepper. Simmer for 5 minutes. Arrange the stuffed cabbage leaves neatly in a single layer in the saucepan. If you had more filling than cabbage leaves to fill, use the rest to make meatballs, and tuck them in around the rolls. Bring the sauce back to a boil. Transfer the pan to the preheated oven and bake until the bundles are cooked through and firm to the touch, 25 to 30 minutes. Use a large spoon to transfer the rolls to a platter or storage container. With an immersion blender, puree the sauce together with the sour cream. 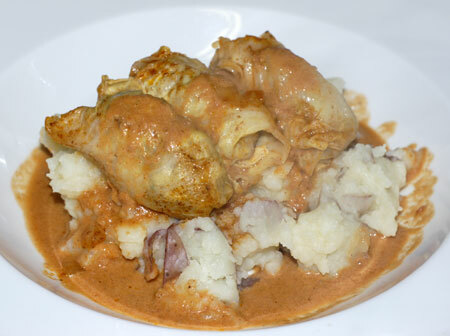 Serve the cabbage rolls with mashed potatoes, rice or spaetzle to sop up the luscious sauce.